There is an app for everything these days so I guess it stands to reason that when it comes to a major life event like pregnancy— full of questions, quirks, rules, and purchase decisions— there would be a billion apps to help you along with the process as well. I’ve found there are basically four major categories for pregnancy apps— daily or weekly pregnancy trackers, apps to help you along with the actual birth, pregnancy checklists and baby naming apps. I tried one for each category to find out if any were worth the time it takes to download. When you first log-in, Baby Center’s app asks you for your due date and then it gives you a daily calendar with a tidbit of information or an activity to check off each day, based on the number of days you are pregnant. For instance, I am currently 31 weeks, so today Baby Center asks me if I have noticed the muscles in my uterus tightening. I can click on the prompt and it takes me to an article explaining why. Tomorrow, it tells me to make an appointment to tour the hospital where I am giving birth and the next day it tells me how to prepare for breastfeeding, including a little prompt to do something nice for myself with a check box. Prenatal massage, maybe? There is a menu on the bottom that allows me to access my calendar, my activity checklist (tour your hospital, track your weight gain, take your prenatal vitamin, etc. ), the birth club (which takes me straight into the Baby Center community boards), and tools (which at this point, only appears to include a kick tracker). The calendar would be way more interesting if I had started using the app right from the beginning of my pregnancy. As it stands, when I see Monday’s “Is it safe?” prompt about unpasteurized juices, I would like to be able to click on “Is it safe?” to take me back to every post prompt in that category, but the app doesn’t allow me to do that. Same goes for the checklist. It is only arranged by week, not by category, and it includes a lot of unnecessary stuff like “check in with a friend” and “pack healthy snacks,” so it would be nearly impossible to go back through and find the important items. I say, if you start it from DAY ONE, the Baby Center app could be fun and informative. But I think using a book that you can easily reread and refer back to, like “What to Expect When Your Expecting” is way more valuable and comprehensive. And if you have any questions about what to eat or how much weight you should gain, you can always Google. I’ll give it points, the 50,000 Baby Names app has a lot of names, that’s for sure. There are way more options than you see in most baby naming books. Plus it gives you the meaning of the name and the allows you to mark it as a favorite. BUT, for whatever reason, every time I search a name, including names that are not obscure at all, the listing comes up empty. I must be doing something wrong but if an app isn’t intuitive then what good is it? I’ve been finding names by using the scrolling alphabet on the side which can be very tedious. Particularly since there are so many names. Also, since the app is free, there are tons of pop-up ads and prompts to download other apps in their catalog which is annoying. It does have a neat feature on the top right which lets you see an alphabetical list of celebrity names, bird names, flower names, etc. But all in all (and I actually tried out a few naming apps including downloading a whole book on my kindle), I have found that no name search beats the experience of flipping through a tangible book. You need to highlight or turn down the corners or write name lists— in pen. A naming app just doesn’t seem to do the naming process justice. Baby Checklist is a super simple app that is basically the list you would get if you registered at somewhere, like Buy Buy Baby. The opening page of the app tells you how long you have left in your pregnancy and what percentage of your purchase list is complete. In other words, you are in a race with your baby to buy a bunch of stuff before he/she arrives. Although the checklist is helpful, it really is the same thing a baby store will give you on piece of paper when you register. I guess it just depends on how much you want to track things with a pen and paper or on your phone. Also, what I found most valuable during my first pregnancy, was a list a friend made for me of basic essentials with name brand recommendations. I pretty much know what to buy, but having never had a baby before, I had no brand associations and really needed some guidance. The Buy Buy Baby store can be really overwhelming to a novice. Unfortunately, the Baby Checklist keeps it generic and gives no brand recommendations whatsoever. I downloaded this contraction app upon recommendation from a friend of mine during my first pregnancy. I remember shopping in Trader Joe’s two weeks before the baby was due, and feeling a pang in my uterus. I assumed it was Braxton-Hicks but decided to test out Contractions in preparation for the real thing. Each time I felt a pang, I tapped the belly, waited for the feeling to subside and then tapped it again when it was over. When I got home from Trader Joe’s, I looked at what I had been recording the whole time I was shopping. That’s when I noticed each pang was four minutes apart. Holy crap! This is happening! I rumply called both my husband and my doctor. If I hadn’t used Contractions, I wouldn’t have known I was already in labor. Plus, there is no way to really record anything with a stop watch, a pen and a piece of paper while you are grocery shopping. Contractions allowed me to easily do two things at once. I’ve kept Contractions on my phone for the past 2+ years and plan to use it again with the next one. I want to point out that I am constantly on my phone and rarely pick up a book. So, it surprised me to feel like having a book to track my pregnancy and a book to search for names was so necessary. 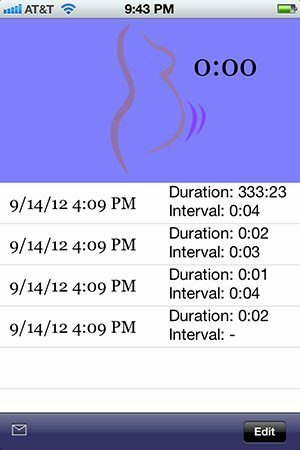 The reason I love Contractions so much is because it is a necessary electronic utility— it takes the thinking out of recording your contractions, which is what any good app should do. 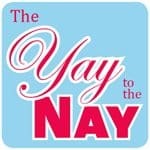 As we have learned in all our The Yay to the Nay posts, your feedback and recommendations really help others. So please share. 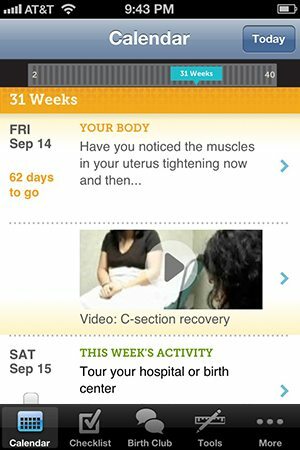 Do you use pregnancy apps? Which ones do you recommend? If you’re looking for ideas and recommendations for a baby registry, don’t miss our Baby Registry Checklist. Ilana Wiles writes Mommy Shorts, a popular NYC humor blog geared towards new parents. In addition to blogging, Ilana has worked as a creative in advertising for the past 15 years. She lives in the East Village of NYC with her husband, her two-year-old daughter and a rapidly growing pile of stuffed animals. I used a contraction app called “Full Term” with my second kiddo. It rocked my world. I just tapped along, rode through every contraction, and was so completely wrapped up in the app that I barely made it to the hospital and was pushing before I got into a room. Can’t really recommend it enough. I got a free month by month book from my doctor which I don’t love so downloaded the Baby Center app on recommendation from a friend. I really like having something to read every day. I don’t like the way the What to Expect books are written so I knew I wouldn’t like that one. I like the idea of the contraction app. Would be nice if they’d add that in to the Baby Center app! I’d just like to reccomend the Feed Baby widget. It’s a great little phone application that allows you to time and track breastfeeding, bottles, diapers, sleep times, pumping sessions even solid food intake. I don’t use it much now at 4 months, but for the first 2-3 months it was an invaluable tool to make sure breastfeeding was going all right. It keeps a log, but it also puts the information is readble charts. And you can export data to an excel sheet. Thanks Annie. This post focused on Pregnancy Apps. We’ll check it out if/ when we look at new baby/ baby care apps in the future. oh and BabyBump has a place to record your doctor appts, questions you want to ask, etc. Really is an awesome little app. I’m expecting is another great pregnancy app.